• Turkey is the traditional dish for the Thanksgiving feast. 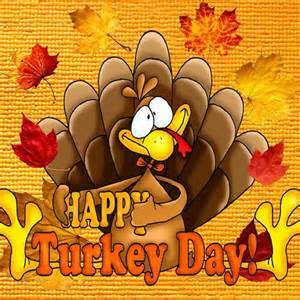 In the US, about 280 million turkeys are sold for the Thanksgiving celebrations. There is no official reason or declaration for the use of turkey. They just happened to be the most plentiful meat available at the time of the first Thanksgiving in 1621, starting the tradition. • Turkeys were one of the first animals in the Americas to be domesticated. • The Guinness Book of Records states that the greatest dressed weight recorded for a turkey is 39.09 kg (86 lbs), at the annual “heaviest turkey” competition held in London, England on December 12, 1989. • Turkeys have heart attacks. When the Air Force was conducting test runs and breaking the sound barrier, fields of turkeys would drop dead. • Fossil evidence shows that turkeys roamed the Americas 10 million years ago. • Black Friday ads usually come out Thanksgiving Day, but that doesn’t mean you have to wait until then to start planning. Head online to sites like BlackFriday.com and bfads.net for a sneak peek at this year’s ads, or just download BlackFriday.com’s mobile app to stay on top of the latest info. It makes it easy to check ads on the go, and allows you to build a wishlist. • Just because it’s on sale doesn’t mean it’s a great deal. Use a price comparison website like pricegrabber.com, to compare prices at competing retailers before you buy. • Some store will match a competitor’s price on an identical item. Others will allow you to buy merchandise in advance of the sale, and to then return and rebuy the items on Black Friday. • Sign up to receive e-mail newsletters from all of the stores that you plan to shop at. Newsletter subscribers frequently receive extra savings. • Want to avoid the crowds? Then, shop online. Many stores offer the same Black Friday specials on their website, and even throw in free shipping – a real bonus. And if that doesn’t already sound like a sweet deal, consider this: Black Friday sales frequently kick off online at midnight on Thanksgiving, while most in-store sales start at 5 a.m. the next day. We’ve had an abundance of rain and falling leaves lately. 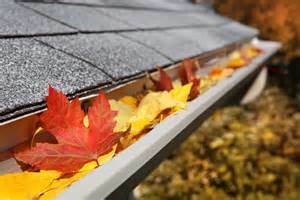 By now your roofs, gutters and walkways probably have a thick coat of wet leaves. It’s important to clear those leaves off of your roof and gutters to prevent damage to your roof as well as avoid wood rot and other potential home maintenance issues. Even if you have gutter guards; debris still gets in the gutters which can lead to back up. It’s also a very good idea to pull leaves away from your house and foundation to be sure water flows away from the house instead of toward it. Another beneficial item on the list is to add extensions to your gutter downspouts to insure water goes as far away from the foundation as possible. Heed this wise advice and you’ll thank me later because your home will be warm, dry and cozy this winter. You’ll also have less maintenance chores in the Spring.